Robert Plutchik was a psychologist who developed a psychoevolutionary theory of emotion, considered one of the most influential classification approaches for general emotional responses. Plutchik suggested that there were eight basic emotions; anger, fear, sadness, disgust, surprise, anticipation, trust and joy. He proposed that these primary emotions are biologically primitive and have evolved over time in order to increase the reproductive fitness of humans. He believed that each of these emotions had the ability to be the trigger of types of behavior with high survival value. An example of this would be the way in which fear triggers the fight-or-flight response. When we think about our emotions, we tend to think of them as related to our feelings. For example, we may describe pain as the state of feeling unhappiness or displeasure. By definition, an emotion is any relatively brief conscious experience characterized by intense mental activity and a high degree of either pleasure or displeasure. 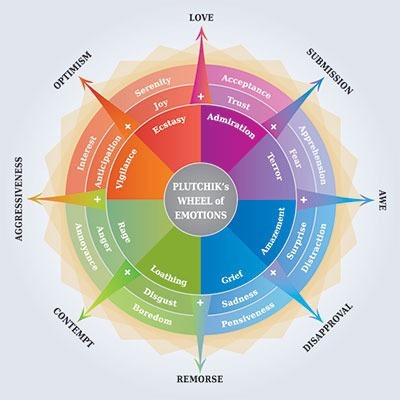 Plutchik created the wheel of emotions to illustrate the various relationships among emotions. While he identified only eight basic emotions, you can see from the wheel that there are different degrees which create a wide spectrum of emotions. Because of this, emotions tend to be far more complex than most people realize. For each of us, our emotions have a lengthy evolutionary history throughout our lives. They not only evolve over time, they are adaptive in order to improve various aspects of our lives, such as our happiness and social abilities. Emotion plays an important role in terms of survival, and it influences both cognition and behavior. For example, imagine you were in the woods and you encountered a bear (threatening event). You would probably think you were in danger (cognition), which would cause you to feel fear (emotion). Your fear in turn activates a fight-or-flight response. In response to this event, you might move slowly away from the bear in order to escape (goal-directed behavior). Trust → a positive emotion. Anticipation → in the sense of looking forward positively to something which is going to happen. These emotions are represented on the illustration above. The intensity of each emotion decreases as you move outward and increases as you move toward the wheel’s center. The intensity of the emotion is also indicated by the hue of each color. The darker the shade, the more intense the emotion. For example, the wheel shows anger at its least level of intensity as annoyance. At the highest level of intensity, anger becomes rage. Animals and Humans: Animals and humans both experience basic emotions in similar ways. Evolutionary History: Emotions developed as a result of evolution. Emotions were present in animals before apes evolved. Survival Issues: Emotions evolved over time in order to increase the chances of survival. For example, the emotion of trust results in collaboration and sharing between humans. Prototype Patterns: Despite different forms of expression of emotions in different species, there are certain common elements, or prototype patterns, that can be identified. Combinations: All other emotions are mixed or derivative states; that is, they occur as combinations, mixtures, or compounds of the primary emotions. Hypothetical Constructs: Primary emotions are hypothetical constructs or idealized states whose properties and characteristics can only be inferred from various kinds of evidence. As mentioned earlier, Plutchik’s eight basic emotions are joy, trust, fear, surprise, sadness, anticipation, anger and disgust. Each of these primary emotions has a polar opposite, so that joy is the opposite of sadness, fear is the opposite of anger, anticipation is the opposite of surprise, and disgust is the opposite of trust. Since the Plutchik’s development of psychoevolutionary theory of emotion, is has become one of the most influential classification approaches for general emotional responses. Based on his work, research has continued into how we discern emotional substrates in the behavior of nonhuman animals, many leading to the discovery that stimuli are experienced by people and animals alike and result in prototypical behavior. Parrott, W. (2001). Emotions in Social Psychology. Key Readings in Social Psychology. Philadelphia: Psychology Press. Plutchik, Robert (1980). Emotion: Theory, research, and experience: Vol. 1. Theories of emotion, 1, New York: Academic. Plutchik, Robert (2002). Emotions and Life: Perspectives from Psychology, Biology, and Evolution, Washington, DC: American Psychological Association. Plutchik, Robert; R. Conte., Hope (1997). Circumplex Models of Personality and Emotions, Washington, DC: American Psychological Association. Shaver, P.; Schwartz, J.; Kirson, D. & O’connor, C. (1987). Emotion knowledge: further exploration of a prototype approach. Journal of Personality and Social Psychology. 52 (6): 1061.